Retail Price: $53.00 Log in for LOWEST PRICE! We are always interested in the names of wineries as well as the names of their wines - when they're out of the norm. We thought that this selection was named after the grand opera by Puccini, but not so. 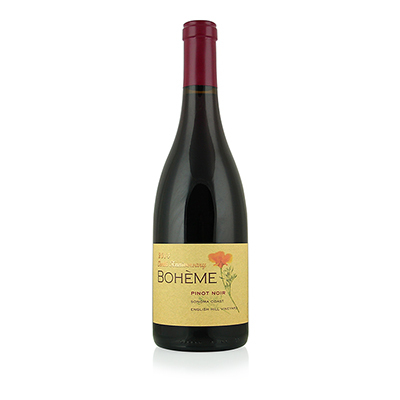 Its name comes from the Bohemian Highway that runs along the Sonoma Coast, where the vineyard is located. Kurt Beitler is the owner and winemaker at Boh?me Wines. He loves to wax rhapsodically about the importance of the soil, the challenge of growing and making Pinot Noir, and the overall Zen-like experience of making wine. Then he mentions that his uncle is Charles Wagner of Caymus Vineyards, a winery whose history goes back almost 50 years and would probably land on the all-time top 10 list of California wineries, by most wine people. With that kind of history in your blood, it's almost impossible to think about doing something else. That was the case with Kurt. He was raised in Sonoma, and there aren't too many better places to start making wine. Many of the most revered Pinot Noirs come from here. The area's rolling hills and cooler climate make ideal conditions for growing this finicky grape. But, it also takes skill, experience and patience. When all of these aspects work together, the result is a spectacular selection like Boh?me's Pinot Noir. The color is a lovely, translucent magenta, signaling the engaging candy apple nose with spice and truffle. Similar flavors ensue and become a rhapsody on the tongue.